When being mixed race is more than just an identity, it’s a matter of life and death. That’s the premise of Jeff Chiba Stearns’ new documentary Mixed Match, playing at CAAMFest 2017 in San Francisco, this March. 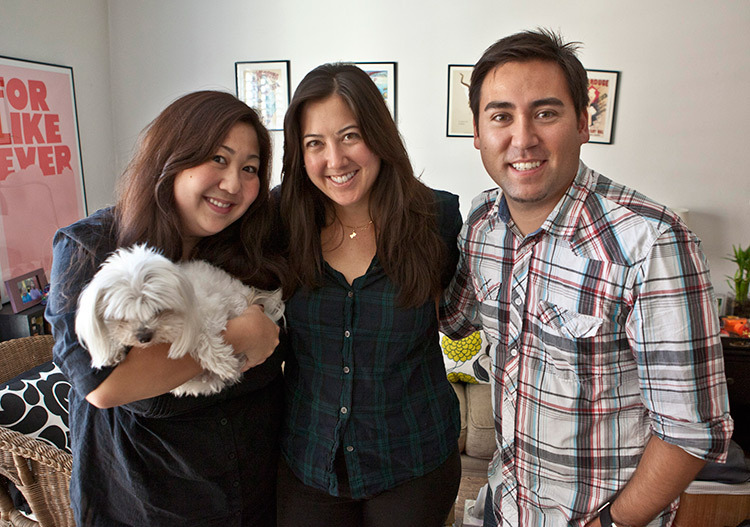 Six years ago, I interviewed filmmaker Jeff Chiba Sterns about his documentary One Big Hapa Family. 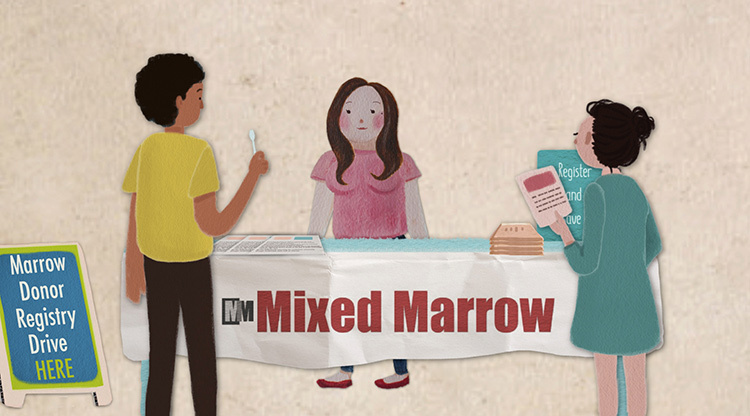 During our phone call, he mentioned about his next project — a documentary about the need for bone marrow donors for mixed-race people that he was working on with Athena Asklipiadakis of the non-profit organization Mixed Marrow. It was quite the journey collecting all the stories and doing the research finding the best experts on the topic, we amassed about 200 hours or more of footage that we had to condense down to an hour and a half so it was quite the job for Jeff who did all the editing. Also, because of the unpredictability of the patients health, we had to go with the flow and see what happened organically and follow those roads. During the 96-minute documentary, we follow Athena as she travels around the country to meet patients like Krissy Kobata, Valerie Sun, Imani Cornelius, and Maya Chamberlain. The film also introduces audiences to the family of Hunter Thawley, a little boy who passed away when a match was not found in time, but whose short life continues to inspire the Healing Hunter Foundation. Athena and Jeff are thrilled that Mixed Match has already received awards from the Asian Film Festival,Toronto Reel Asian International Film Festival, and Spokane International Film Festival. Its really nice to now be on the other side seeing the fruits of your labor and hearing a positive response from people. Having a vision to transform thoughts on donation and encourage donors was something I hoped for, but wasn’t sure how effective we could really be, but with Jeff’s amazing work, we were able to piece together something pretty powerful and its super amazing to know the film is doing what we set out to do. Not in the Bay Area? 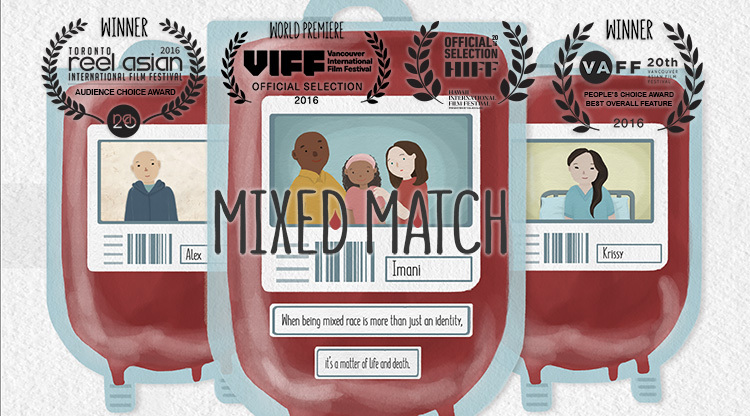 Check out the Mixed Match website for a full list of screenings. Tickets go on sale on the CAAMFest website February 13. While you’re checking out CAAMFest, also take a look at a couple other films and events with mixed-race or family themes. Director Jivan Atman lifts performance as testimony in a multimedia presentation that emerged from a collaboration between Morehouse and Spelman College students. Through monologue, conversation and spoken word, identities are unpacked and reconstructed, be they imposed or claimed, erased or recognized, out, enough, emergent. The writer-performers center their lives as primary text, interrogating the self as they move through pride, isolation and desire — in doing so, interrogating also the viewer. When we think of Asian America, Cleveland is not the first place that comes to mind. In GOOD LUCK SOUP, filmmaker Matthew Hashiguchi shows us why this often overlooked part of the country is as important as others in understanding the Asian American story. Through interviews, personal home movies and thoughtful narration by the filmmaker, Hashiguchi shows us what it was like to grow up mixed race in a predominantly white Midwestern neighborhood, where it wasn’t always welcoming or accepting. A family-friendly afternoon in Oakland with the top creators of new children’s books and graphic novels. From the author and illustrator of the popular children’s board book A is for Activist, Innosanto Nagara’s new release, My Night in the Planetarium, is centered on his childhood in Indonesia. Artist Thi Bui will share insights on her new graphic novel, The Best We Could Do, and share a sneak peek with the advance reader’s copy of A Different Pond, a children’s book written by Minneapolis-based poet Bao Phi and illustrated by Bui. Co-authors Stan Yogi and Laura Atkins share the process behind the new Fred Korematsu Speaks Up graphic novel geared toward middle school children. Illustrator Nidhi Chanani debuts her YA graphic novel, Pashmina. Hear from these creative minds about their inspirations, artistic process, and how their personal experiences inform storytelling. See the full schedule of films at the CAAMFest website.